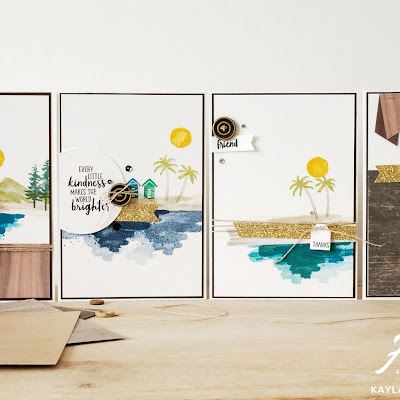 Hello everyone and welcome to another Artisan Blog Hop this time featuring the ever so gorgeous Abstract Impressions suite from the brand new 2018-2019 Annual Catalogue. This suite really grabbed me when I first opened the catalogue. 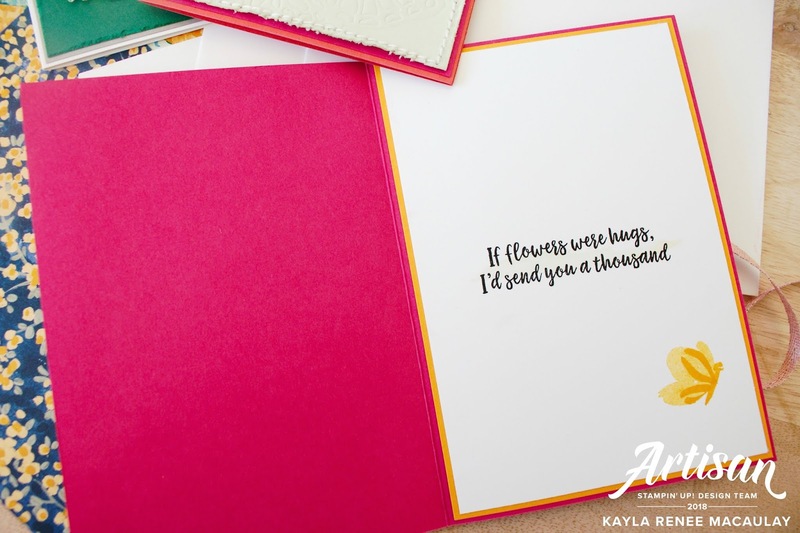 I loved the bright colours, busy papers and gorgeous florals plus all the colours are to die for! 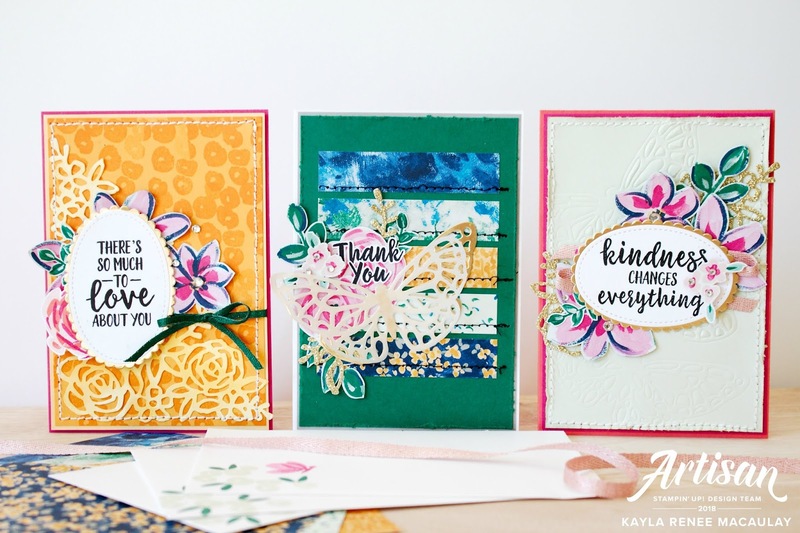 I was also totally in love with that butterfly die featured on the Shaded Spruce card in the middle. That butterfly was part of the centrepiece decorations at Onstage in a large size and when I saw it at set up day I remember saying to people that I hoped it was a die in the new catalogue...my wishes were answered! 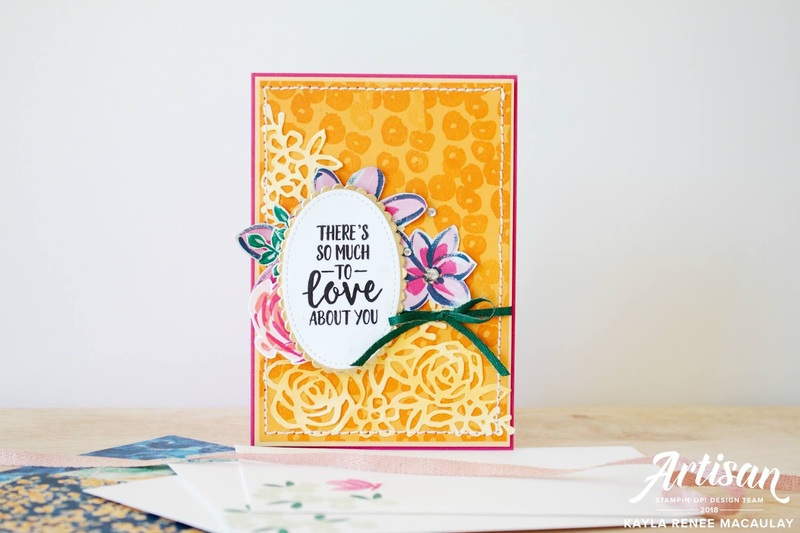 I am totally in love with it and can see it being a heavily used die in my card making and craft projects. I have a house full of boys but I am a girly girl at heart! I love all things glittery and floral! I decided to make a set of three cards, all in a relatively different style, but I wanted to show off lots of the different components to this gorgeous suite. Thanks for hopping by my blog today and be sure to see the end of this post for all the links to the rest of the blogs. Here's a look at the completed set of cards that I created. From left to right I created a card featuring a different technique. 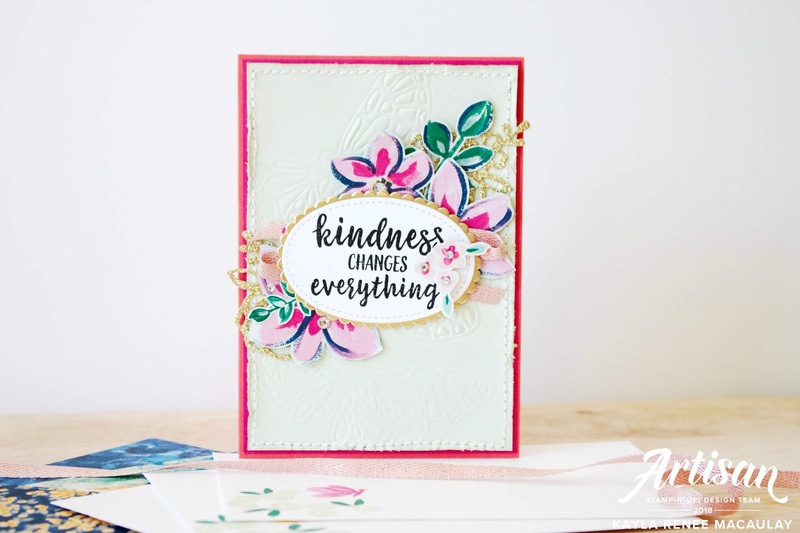 The left card features a beautiful Mango Melody base with repetitive background stamping and I used that beautiful large floral corner die and cut it in Thick Whisper White and then used an Aqua Painter with some Mango Melody Ink to watercolour it. 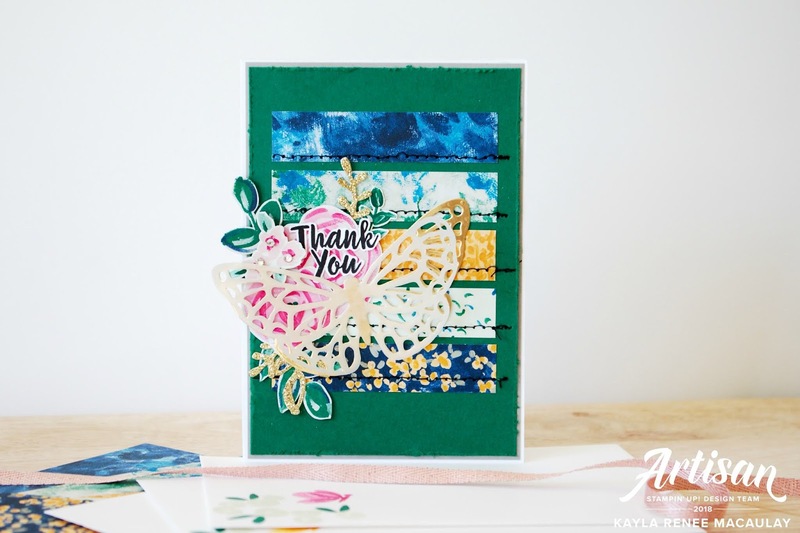 The Shaded Spruce Card features the beautiful Garden Impressions Designer Series Paper which I cut into strips and sewed to the base of the card with some messy machine stitching (I am no sewing expert...so I go for the messy look!) and then added one of those GORGEOUS butterflies cut in Gold Foil Cardstock with a bit of Vellum layered over the top. I coloured the vellum using Clear Wink of Stella. The last card I really wanted to focus on the fantastic BigShot Embossing Matts so I repetitively embossed that gorgeous butterfly across the background layering of Soft Sea Foam to create some interest to the background. I used some of the gorgeous Metallic Ribbon Combo to accent behind my sentiment. Here's a close up look at the Mango Melody card. As you can see I have used some machine stitching around the edge of the card in white. I have a new obsession with stitching on cards lately, I love the texture it adds! I stamped and fussy cut one of the abstract flowers from the stamp set and the rest of the flowers and leaves are fussy cut from the beautiful Designer Series Paper. 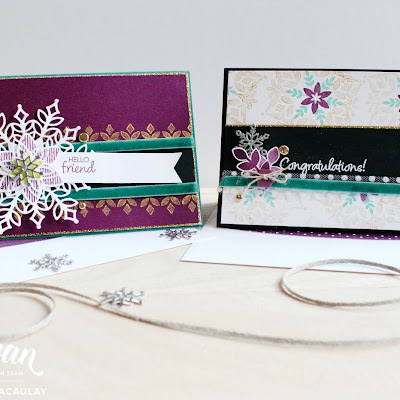 I used the gorgeous Shaded Spruce Metallic Ribbon to accent the card. This is probably my favourite of the three cards. I wasn't sure I would love Soft Sea Foam but paired with bright colours, it's amazing! It's going to be one of my favourites. 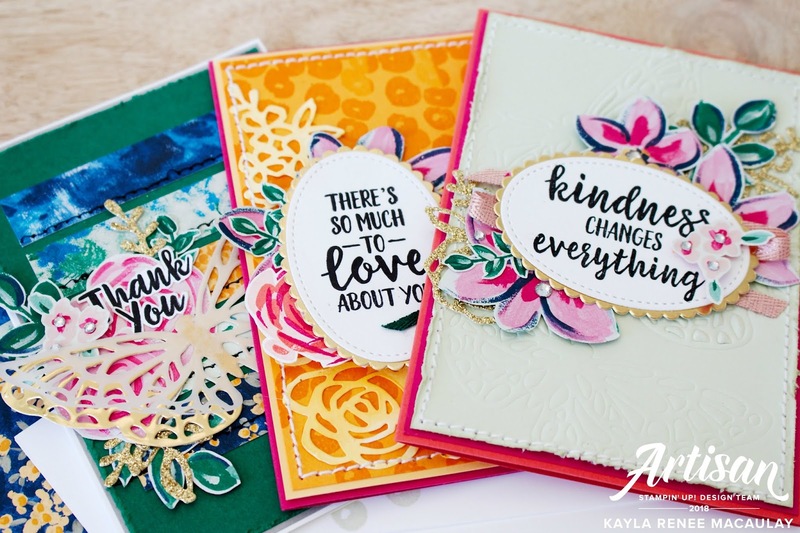 I love the sentiments featured in this stamp set, they are so versatile and are going to be so useful for the types of cards that I love to send. I once again added some machine stitching and distressed the edges of the card with the edges of my scissor blade. I also cut one of those large floral corner pieces in Gold Glimmer Cardstock and cut small floral and leaf pieces out and clustered them into my centrepiece. 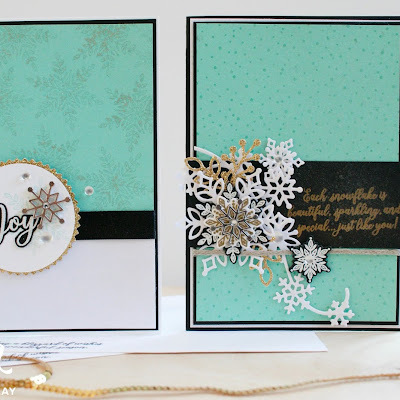 The last card features that gorgeous Shaded Spruce colour. I paired this bold colour with strips of the Designer Series Paper to really make them 'pop'. I added some messy black machine stitching for an 'abstract' look (who am I kidding?...I am just bad at sewing and go with it!) and clustered some fussy cut flowers and leaves around my die cut butterfly. Here's a close up of all three finished cards. They are very busy and there is lots to look at but I am happy with all the texture and dimension. This suite is really fun to play with and I can't wait to make lots more handmade creations with the gorgeous Abstract Impressions suite! Of course they wouldn't be finished without a decorated inside so I stamped this gorgeous sentiment and one of the three step butterflies in a coordinating colour. I have also handstamped a coordinating envelope which you can see in the above photographs. I hope you enjoyed this little look at what I have created with this suite and will be inspired to go and have a play with it too! I would love to see what you make.